Reverend Ernst Toller paces around his quiet, almost deserted church in a suburb of New York, contemplating his life to this point and his purpose in it going forward. He chooses to start a journal, writing down every feeling and thought for 12 months, at which point the journal will be destroyed. An exercise that seems pointless on the face of it works cathartically for Toller, a man determined to work against himself somehow. He is played by Ethan Hawke, an actor who seems as much at home in sci-fi blockbusters as he is in arthouse drama, and his portrayal of Ernst Toller in ‘First Reformed’ is one of his finest. It’s the story of a minister who has become disillusioned with his life and his faith as his congregation shrinks (whilst the nearby megachurch grows and grows) and it builds slowly as Toller is increasingly tempted to take a turn towards darkness. Paul Schrader has had a lot of success as a writer, particularly when collaborating with Martin Scorsese, but his efforts as a director have often failed to hit those heights. 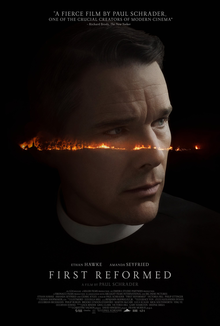 In the case of ‘First Reformed’ and the Reverend Ernst Toller, Schrader has crafted a character study to match his finest earlier creations and we can track the similarities between the weighty themes explored in these works, particularly around the nature of religion and guilt. I liked the slow burn nature of the plot, particularly in the way the film segues into more of a thriller without the audience even realising it, and that’s testament to the sharp writing and strong central performance from Hawke. I thought Amanda Seyfried was really good as a troubled parishioner and I felt that Toller’s background, specifically surrounding his son’s death in the war, is neatly woven into the narrative. We can understand and empathise with him even as we may disagree with his actions and I felt ‘First Reformed’ packed more of a punch than I expected as it delved into its themes. ‘First Reformed’ is a superb character study of a disillusioned minister, played brilliantly by Ethan Hawke, and it marks a high point in the career of writer-director Paul Schrader.